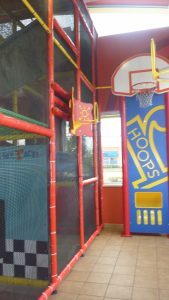 A new McDonald’s restaurant was recently built only a few blocks from me and I couldn’t help but notice the lack of a play area in the facility. This post is not meant to make any personal statements positive or negative about the restaurant itself or the food, and I would also rather not focus singularly on this chain, but it seems to be the only fast food restaurant in my area that does have an indoor play area. So, as the circumstances warrant, this will be a look at the McDonald’s PlayPlace exclusively. To be honest, I don’t have any childhood memories of the McDonald PlayPlace specifically, but I am used to seeing the tunnels and slides almost as much as I recognize the golden arches. Driving by the newly built establishment, I had to take a second look to confirm that there were no slides, and as I thought about it, I couldn’t say for sure if any of the plentiful locations by me still did. With the summer weather officially ended, I am continually looking for ways to continue physical activity for my son, and, more often than not now, that will require me to turn to indoor opportunities. Fast food play areas have gotten a reputation for being dirty and unsafe, but I don’t have much first-hand experience to justify (or refute) that stereotype, so I decided to take a look before I dismissed this possibility. McDonald’s website has a convenient restaurant locator that also gives a list of services, such as free WiFi and PlayPlaces, for each location. 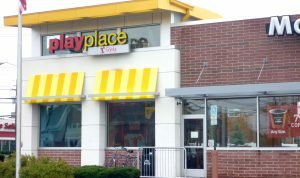 While I confirmed my suspicion of a lack of local PlayPlaces, I was still surprised to find that only 4 of my closest 25 McDonald’s offered a play area, especially since, according to Fast Food Nation, McDonald’s is the “largest private operator of playgrounds” in the United States. 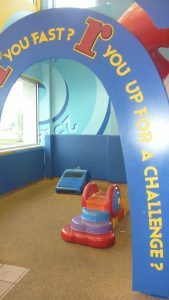 Nationally, about 40% of locations still have a play area, and some have even made it a local attraction, namely the Orlando, Florida two-story restaurant otherwise referred to as World’s Largest Entertainment McDonald’s & PlayPlace, or ’the Best McDonald’s to Play In’, according to the Travel Channel. While I had reservations as to the accommodations my local McDonald’s would offer, I took a visit to the closest one. I never intended on relying on the fast food franchise to be a frequent “hang-out”, but, in the interest of having a few go-to places, especially free places, for when the winter weather makes regular home activites stale, I thought there would be no harm in checking it out, and maybe I would even be pleasantly surprised. 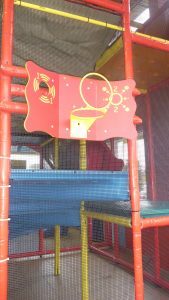 My first impression of the Playplace was actually positive and the play area did not look as filthy as I had prepared myself to expect–it looked pretty clean. One change that I had not been aware of was the redesign of PlayPlaces to what’s referred to as ‘R-Gyms’. 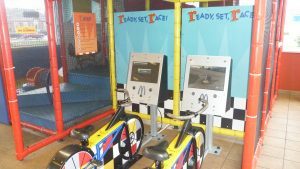 There were two stationary bikes positioned in front of two screens that play a video game when you ride. 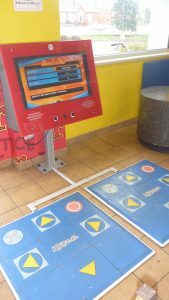 Also available were two dance pads in front of a screen, very similar to the popular Dance Dance Revolution. My first reaction was, “Are these free?”, as they seemed too cool to just be there for customers, or maybe it was a generational reaction to being exposed to too many businesses making a secondary profit off of “while-you-wait” entertainment. But they were free, as was a basketball area, all flanking the traditional “tunnels and slides” (though likely a downsize of the old-school versions I had seen growing up). The R-Gym features looked more modern and the interactive screens definitely play into the “cool” technology factor, as I clearly demonstrated, but even if I might find it entertaining, my son is not old enough to get any use out of it yet. Rightly so, the R-Gym is designed for ages 4-12. There is a toddler dedicated area, but this turned out to be the beginning of my disappointment. The toddler area, supposedly dedicated to children 25 lbs and under, was pathetically bare, and though I didn’t step into the confines, I could see from where I was that it was filthy. The foam climbers looked dark and dull, either from dirt or being worn, but either way, I was disinterested. The old-school jungle gym area was also noticeable dirty, and was confirmation of the rumors that I had heard. My visit didn’t end in a definite no, but more of a not-now (not at this age), and not unless I’m really pressed for somewhere to go or something to do. 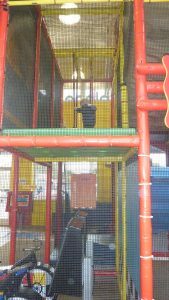 I only went to one of the four locations by my that offers a play area and I didn’t venture far into the jungle gym, just enough to see that it probably wasn’t the best place for my youngster. When cabin fever encroaches in the next few months, I may take a field trip to see if the others are equally unclean and also to see if the R-Gyms at other restaurants have more features. The stationery bikes, mini-basketball court, and electronic dance pads are not the only additions that are included in some R-Gyms. Apparently, some locations also provide rope climbing, monkey bars, foesball, climbing walls, obstacle courses, arcade games and even a maze. The conversion from the tradition Playplace to R-Gyms started in 2006 as only a small part of the ‘Forever Young’ redesign program McDonald’s undertook to revamp and remodel its restaurants nationwide, as I’m sure many people have noticed the change in architechure at newer locations or even the adjustments, like the double drive-thru, at older ones. The new design incorporated and expanded seating for parents within the designated play area as well. The R-Gym was marketed as an initiative to incorporate more technology into the play areas, no doubt an effort to align itself with the arcade generation and the abundance of video games and interactive electronics, but is also meant to generate a greater emphasis on aerobic activity and promote a balanced and active lifestyle. Representatives from McDonald’s were quoted as describing the traditional PlayPlace activities as less active and even as being passive, which I don’t agree with and find it comical that when I was at McDonald’s, there were half a dozen kids running around like crazy while the bikes and dance pads sat unused. There was one person using the basketball hoops, and it wasn’t a kid, and they weren’t used for very long. I’m assuming the PlayPlace tunnels and slides were referred to as passive more as a relative description, and considered plain and boring to play up the excitement level and hype of the electronically honed R-Gym. While I personally bought into the coolness factor of the R-Gym attributes, from the perspective as a parent, I see the equipment as mini-versions of an adult gym–structured activities that try to make monotonous activity fun. While there weren’t any calorie counters that I could see, it seemed like the initiative sacrificed creativity and social interaction (activities are geared more for one or two people at a time) for the sake of raw motion. It’s not surprising that such an initiative was undertaken as this followed the media attack on McDonald’s for significantly impacting childhood obesity. Not much earlier than this was when McDonald’s changed it’s Happy Meal options to included alternative choices to french fries and fountain drinks. Critics of the R-Gym state that while McDonald’s is trying to promote physical activity, the time required to actually burn those calories would be way longer than the average child is actually going to utilize them for. To that, I have to ask, what happened to fun and playing being the perogative, and not just how many calories can you burn? Also, the place a parent chooses to patron to feed your children shouldn’t be responsible to also providing the facilities for recreation. Regardless, if your child is healthy, the traditional PlayPlace offers more. On the other hand, the R-Gym seems as if it would be easier to clean and maintain as it’s machinery is in the open, more accessible for cleaning, and less corners or nooks and cranies for grime and dust to collect. This seemed true from my experience, but it’s almost ironic that the biggest media coverage about unclean play areas came after the “Forever Young” renovation took place, and didn’t name any of the R-Gym equipment as culprits. Last July, you were probably exposed to the story of Erin Carr-Jordan, and while you may not recognize her name, you probably recognize her account of fast food play areas. Carr-Jordan is an Arizona mom who ventured into one of the jungle gyms of her local McDonald’s and after both she and her child verabilized their digust with its filthy conditions, she took a video on her cell phone and posted it on youtube. After that, she took a cross-country trip with her family and stopped at different restaurants all over the country and collected and tested samples of the dust and grime that she found. While the recount of her situation was published far and wide, it didn’t seem to result in much change, except to further pronounce the already popular stereotype of dirty play areas. What’s interesting is that the focus was mainly on the tunnels and slides, and I can’t recall one accusation of the new R-Gym equipment being a source of uncleanliness. I did read one interesting point that acknowledged a particular vulnerability that fast food restaurants by nature can’t avoid: the correlation of play and food. Certainly not all children eat and play at the same time, but being in a play area at a restaurant automatically adds an element that does nothing but make the ”ick” factor that much more prevalent. Kids run up to the table to grab a french fry and lick their fingers or drop food in unreachable crevices of the gym. This doesn’t excuse any venue from still maintaining regular and frequent cleaning, but any parent who expects anything close to a sterile environment under these circumstances is naive. Carr-Jordan established a website to continue her agenda, KidsPlaySafe.com, and according to the site, “there are currently no regulations at the state or the federal level that require establishments that have indoor play lands (i.e. McDonalds, Burger King, Chuck e Cheese) to keep them clean or safe.” I find this extremely interesting and would think with a lack of regulation, there would actually be more places, restaurants or otherwise, that would provide play areas for children. As much as I understand Carr-Jordan’s perspective, I can’t help but think that regulation is a double-edged sword. 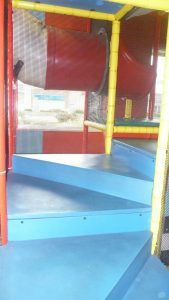 While clean and accessible indoor playscapes are definitely something I strongly believe in and believe there should be more of, regulations have a way of creating more barriers and obstacles and would be yet another concern for businesses on top of litigation and lawsuits that may actually prevent more venues from considering providing such services.